After I've uploaded the code to my module I've made the enxt connections between the homemade module and another Arduino UNO. I’ve connected an LCD to the Arduino UNO and connect D3 and D4 to the trigger and echo pins of my homemade module. Now I upload this next code to the second Arduino and place an object in front of the sensor. 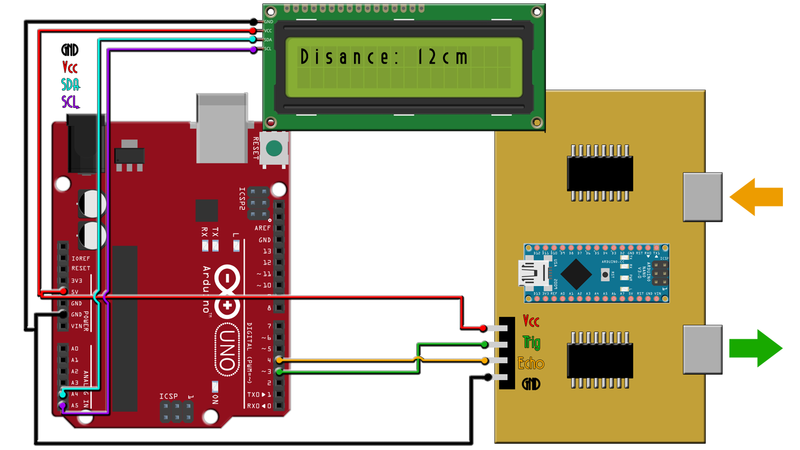 This code will only apply a trigger pulse and measure the delay between the sent and received echo and then print the distance on the LCD. Make the connections above and uplaod next code to the Arduino uno. This code will measure the width of the echo pulse and divide that by 2. Next we multiply taht by 34000cm/s and we het the distance in cm and print it on the LCD. REMEMBER! you have to isntall i2c liquid crystal librery in order to work with the i2c LCD.